When I came upon this cake by Austin based cake designers at Wicked Cakes, I could not pass up the chance to post it. 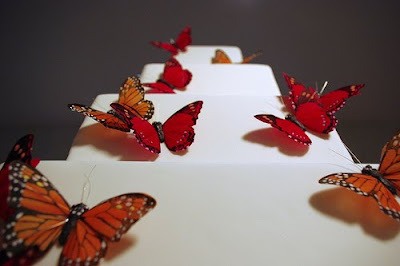 I love the simplicity of the cake itself, and the pop of color and life that comes from the butterflies. Check out the blog! Meg brings together absolutely lovely photos of all things wedding, from cakes to exquisite table settings to real weddings. Thanks, Meg!